One of our subscribers, George Topalides, asked me to set up an oscillator to reflect the variation between price and its moving average. After some discussion, we decided on a simple Moving Average Oscillator that reflects the variance between price and the moving average as a percentage of the MA. The indicator should be used in conjunction with the same moving average, plotted on the price chart, and is used to signal entries and exits in a trend-following system. The Moving Average Oscillator may be used in trending and ranging markets. Go long on a bullish divergence where the second dip does not cross below -50%. Go long when a downward trendline on the Moving Average Oscillator is broken and the Oscillator crosses to above zero. Exit long positions if the Moving Average Oscillator turns down while above 50%. Go short on a bearish divergence where the second peak does not cross above 50%. Go short when a downward trendline on the Moving Average Oscillator is broken and the Oscillator crosses to below zero. Exit short positions if the Moving Average Oscillator turns up while below -50%. Australian miner Fortescue Metals Group [FMG] is displayed with 63-day Moving Average Oscillator and 63-day exponential moving average. Bullish triple divergence gives a signal to go long [L] while still below the 63-day exponential moving average. Note that price crossing the 63-day exponential moving average is equivalent to the Moving Average Oscillator crossing zero. 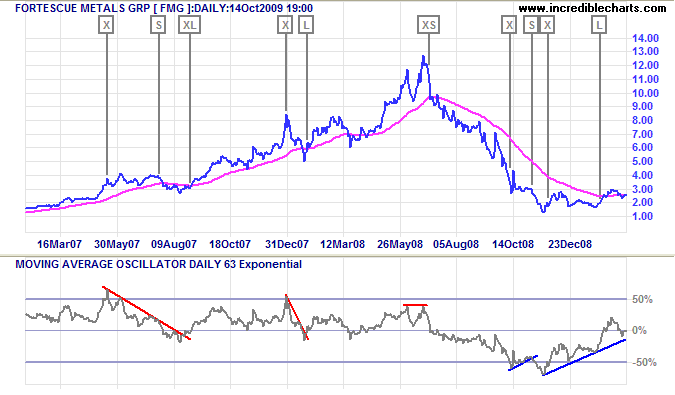 Setup for the Moving Average Oscillator is simple. The default time period is 21 days, but I prefer 63 days for longer trends. We recommend using the default exponential moving average as this gives more reliable signals than a simple moving average. The formula is simply (Close - Exponential MA) / Exponential MA expressed as a percentage.